Babblings of a Mommy: Ravishing Eyes With VS Beauty. Ravishing Eyes With VS Beauty. 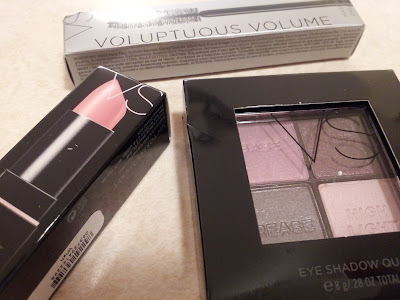 I can't think of a girl who doesn't like to play with make-up, so you can imagine how eager I was to try out a few Victoria's Secret goodies I got in the mail! I currently own a few VS lipglosses and lipsticks, but I've never tried their eyeshadows or mascara. I received the Eye Shadow Quad in Ravishing, which is a light pink/purple combination and not something I would normally pick for myself, but I actually reeeally liked it! It's a very subtle smokey eye that plays off well with my eye color. 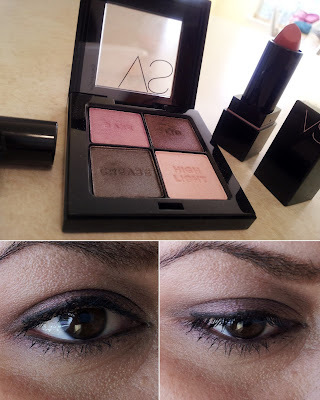 (If you remember from this post, shades of purple are the ideal for brown colored eyes.) This palette works really well for the daytime and can be easily transitioned to night time with just a few touches. 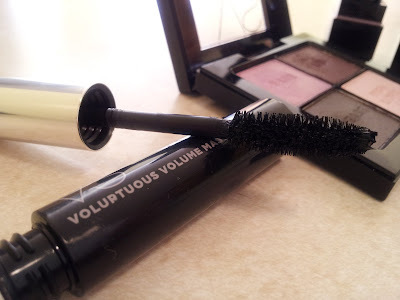 To finish off my look I used the Voluptuous Volume Mascara, (which is pretty decent, but I prefer a thicker formula), and also the VS Perfect Lipstick in Wish. The softest pink lip that went perfectly with my eyes - Loved it! Overall, I think I got some great products on my hand and will definitely be making them a part of my daily rotation. What do you think? Are you a fan of Victoria's Secret make-up? Those are great colors! I like my eye shadows very light like that. Very nice colors on you!